Senior pitcher Kevin Hodgson delivers a pitch during GW's 13-2 win against Towson Wednesday. 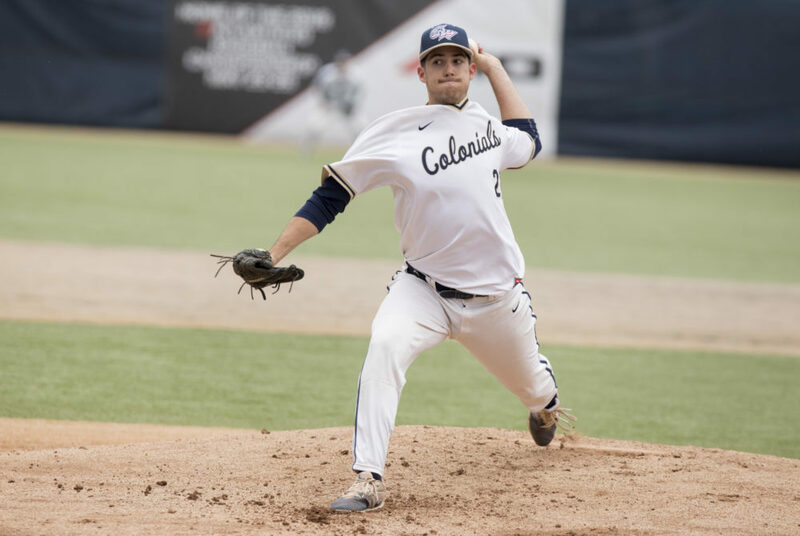 Baseball closed out its seven-game homestand with a blowout victory Wednesday, downing Towson 13–2 and extending GW’s win streak to six games. Pitching coach Rick Oliveri said consistent play from the bullpen allowed the Colonials (13-11, 3-0 A-10) to limit Towson’s (4-18) chances. Off the mound, GW found success around the bases, stealing a season-high seven bags. Senior third baseman Isaiah Pasteur, senior shortstop Robbie Metz and senior first baseman Matt Cosentino each collected two swipes apiece. The Colonials connected for 15 hits on 37 at-bats while limiting the Tigers to six hits on the afternoon. The Tigers took advantage in the top of the first, when senior pitcher Kevin Hodgson walked their leadoff hitter senior infielder Billy Lennox and allowed him to advance on a wild pitch. Lennox scored on a groundout to first to give Towson a 1–0 advantage, their only lead of the game. Despite the shaky start, Hodgson found his tempo as the game progressed, limiting the Tigers to two runs and two hits through 4.0 innings pitched. In the bottom half of the first, Towson pitcher redshirt junior Alex Cuas struggled to find consistency, walking leadoff hitter Pasteur on a full count. Two wild pitches to sophomore right fielder Steven Barmakian allowed Pasteur to round the bases, erasing the Tigers’ lead. Sophomore second baseman Nate Fassnacht batted in the go-ahead run with a double to left center, giving the Colonials a 2-1 lead. Towson quickly turned to its bullpen to limit the damage, but with the bases loaded in the third, Cosentino drew a walk, allowing the Colonials to extend their lead to two runs. The fourth frame opened with Hodgson making an athletic catch on a line drive. Still, the Tigers crossed home plate on an RBI-single through the left side for their second and final run of the game. The Colonials offense got to work in the bottom of the fourth, plating six runs on four hits to bring them to a 9-2 lead. A fielding error on a line drive from Barmakian allowed redshirt freshman left fielder Colin Brophy to score and Pasteur to advance to second. A single from senior outfielder Mark Osis batted in Barmakian and advanced Metz to third on an error, prompting a pitching change for the Tigers. A double from junior utility player Dominic D’Alessandro later drove Cosentino home to finish out the scoring stretch. Senior pitcher Tyler Swiggart entered the game in relief in the top of the fifth, pitching a three up, three down side. Swiggart tossed 3.0 innings allowing no runs and just two hits. 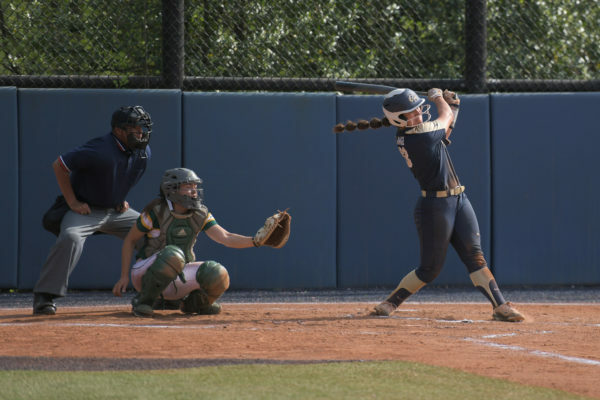 After a quiet fifth and sixth innings on both sides, a triple by Pasteur reenergized the Colonials offense. They plated four runs on three hits to extend their lead to 13–2. Sophomore pitcher Andrew Wheeler relieved Swiggart in the top of the eighth. He helped the Colonials hold onto their advantage, recording three straight outs at the end of the frame to strand two Towson runners. Freshman pitcher Jacob Meyer closed out the game allowing only one hit in the ninth. GW heads to Dayton this weekend for a three-game series starting Friday at 3 p.m.